Four new guests have made a surprise appearance at a Bermondsey care home this week. 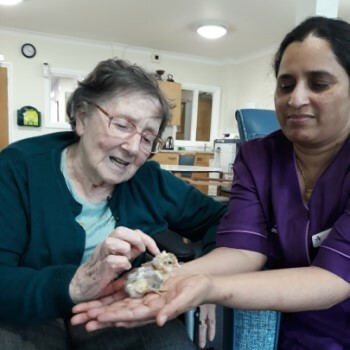 Staff at Anchor’s Bluegrove House care home had placed 10 chicken eggs in a special incubator so that the residents could watch the chicks break out of the eggs and grow. But to everyone’s surprise, three days after being placed in the incubator four of the chicks hatched three weeks early. Bluegrove House care home Manager Margaret Okiror Atiror said everyone in the care home was thrilled with the early arrivals. She said: “The chicks are only temporary residents unfortunately but they will be returned to the farm where they can grow up to lay future eggs that could bring joy and excitement to more people in similar settings. “We thought rather than just get four adult hens, it would be wonderful to watch the chicks hatch and grow. “The chicks have created a lot of excitement in the home and everyone wants to come and see them.